For more than ten years, Applied Scholastics of Malaysia has been active in meeting the demands for work force training in Malaysia and Japan. This office has trained hundreds of employees in English as a Second Language, Study Technology and communication skills. 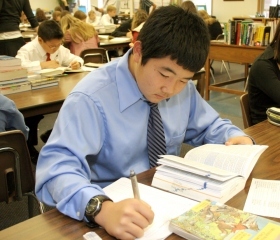 The many government agencies and corporations who have sent staff to Applied Scholastics Malaysia include: Citibank, Malaysian Airport Berhad, Southeast Asia Insurance, Proton Malaysia, Asian Commercial Finance, Arab Malaysian Development, Permodalan National Berhad and United Oriental Bank. In the United States, the Recording Institute of Detroit is a state-licensed professional school that trains people to be recording engineers. It was founded by former Motown Records technician and teacher Bob Dennis. Study Technology courses are an integral part of the school’s curriculum. Students who fail the normal admissions test may still be admitted to the school if they complete a course in Study Technology, which has been proven to give them the skills they need to keep up with their coursework. Study Technology courses are also mandatory for all students who are enrolled in the entire school program, as it has shown to be crucial in enabling them to achieve the required 85 percent pass rate for the final exam.